The first thing that stuck out to me was that the format was essentially sentence by sentence. 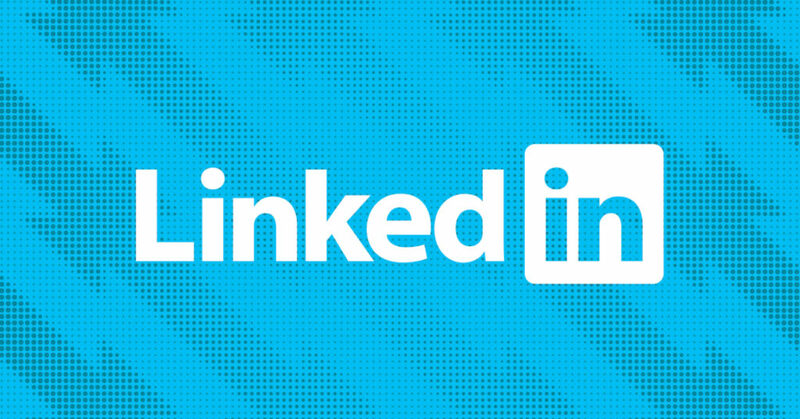 The LinkedIn code will see the line break and truncate the post, leaving just the introductory sentence. This sets up well for clickbait-style lead-in copy. That seems to be trick #1. It occurs to me that if everyone starts posting that way, soon LinkedIn may become unbearable. Common themes for these types of posts involve a “light bulb moment” or “coming-of-age tale” that seeps with enlightenment, tugging at the desires we, as the audience, have ourselves. In this way, the post draws us in and starts to resonate. It leads to us reading the entire post, but most importantly liking, commenting, or sharing. Really, though, this is where the meat is. The extended comment is the make-or-break element. So I went inspirational (and sarcastic), but you know what? I surprised and entertained people. I saw the pattern and exploited it to have some fun. And it got the most responses I’ve ever had on LinkedIn. I reached four times as many people as I can in my immediate network. Fancy that. So after patting myself on the back for achieving my dreams I decided to put this type of post up against a lot of what I see other people on my feed doing. I threw a question out that related to my company’s skillset to get feedback from my network. Short, sweet, honest, and straight to the point. Just trying to start a conversation. I only reached 25% of my network and had zero engagement. Either I asked the wrong question or I have the wrong network to be engaging about my chosen topic. My intent was to lure in engagements as a way to position my expertise in a casual dialogue. Unfortunately, all I got was crickets. 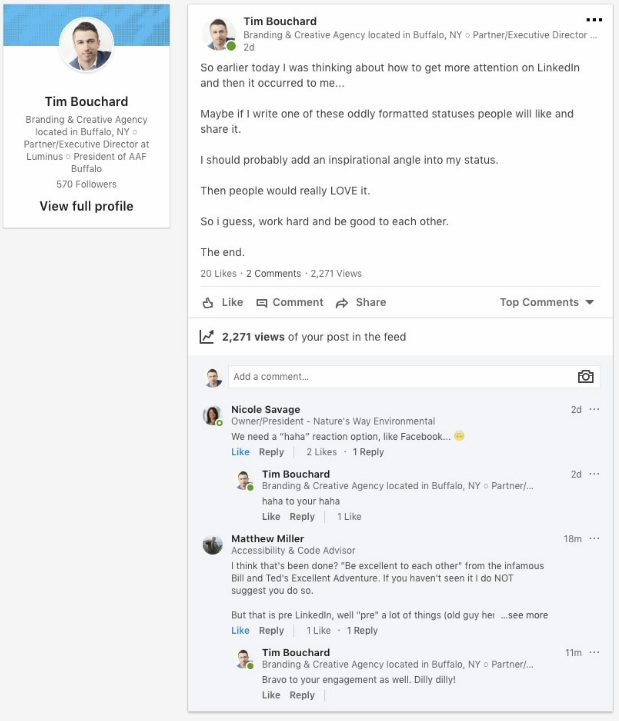 This experiment with my LinkedIn network (sorry fam) really surfaced what I think is often neglected or ignored when we try to cultivate engagement on social media whether you’re working with paid or unpaid posts. People are getting tired of being asked to contribute and drive content to obtain the value. The real performers on social media are offering content and value up front to motivate the engagement. Looking back on my silly post, yes the click-bait lead in drew them in. But they were entertained by the content that followed, even if it didn’t give them exactly what they wanted. I didn’t ask them for anything. The content inspired the engagement. I delivered. Broaden this idea to a larger viewpoint and you start to see why video is taking over. Video delivers immediate value through content with no ask and next to no commitment. So as you plan social content posts, decide what it is you’re offering to your network. Align your expectations for engagement with the value you plan to provide in the post. I’ll let you all get back to liking cat photos now. Thanks for the read.